The sparsely inhabited province of New Brunswick is a wonderland of verdant forests, breathtaking beaches, fragile coastal dunes, and some of the oldest mountains in the world, the Appalachians. Logging is a major industry here, and it's no wonder when one sees the abundance of trees. Part of the historic Acadia (a 17th-century French land claim in North America), New Brunswick is the only constitutionally-bilingual province in Canada where inhabitants speak both English and French. The capital of New Brunswick is Fredericton, home to three universities, the Harvest Jazz & Blues Festival, the New Brunswick Summer Festival, and the Silver Wave Film Festival, which is associated with the Toronto Film Festival. However, Fredericton is only the third-largest city in the province, coming behind Saint John and Moncton. Fundy National Park is a must for anyone wanting to escape into the great outdoors. 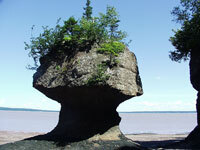 The park comprises the Fundy coast and forest, and features more than 20 waterfalls for hikers to discover. Alternatively, Kouchbouguak National Park boasts warm water tidal pools. The Bay of Fundy is possibly New Brunswick's most popular attraction, its waters rising and falling 40 feet (12 metres) each day with the tides. Visitors can walk along the bay floor and marvel at the tree-tufted sandstone formations, nicknamed the 'Flowerpot Rocks'. They can later kayak around the bay that very same day. This bay also provides some exciting whale watching opportunities too. New Brunswick offers visitors the chance to escape it all and explore the wilderness under big clear skies, a perfect setting for stargazing. We are looking for contributors for our New Brunswick travel guide. If you are a local, a regular traveller to New Brunswick or a travel professional with time to contribute and answer occasional forum questions, please contact us.